Our Junior Division introduces campers to a wide variety of athletics, arts and enrichment activities. This offers them opportunities to explore potential areas of interest and practice skills in a fun, safe, and supportive enviornment. Our program is designed to pique the interests of our campers while challenging them to try new things. Creating opportunities for successful participation in activities, while building positive social relationships with other campers and staff, is what our Junior Division is all about. Swimming takes place in our private Downtown Community Center Pool. Beth and Sam, our Aquatics Directors, works with us year-round. When it comes to learning how to swim in a safe, fun and positive environment, they know how to make it all happen! Learning to swim is an integral part of our summer camp programs. (We are, after all, on an island!) Our experienced aquatics team follows a time-tested curriculum, allowing children to learn at their own pace in groups based on ability. We offer a firm foundation for beginners, and challenge more experienced swimmers to learn proper strokes and techniques as well. Our swim staff includes three certified swimming instructors, three American Red Cross Certified Lifeguards, three teaching assistants, and our aquatics director. In total, we have over ten full-time staff on deck at our pool, not including each group's counselors, who assist and make sure your child is safe and having fun while learning how to swim. Swim classes are comprised of, on average, six to eight children, one instructor, one instructor's aide, and one of the group's counselors who is with the campers all day and knows them well. In addition to our structured swim lessons, supervised free-swim time is an important part of the learning process. It is an excellent way for kids to practice what they learn in class. Under the guidance of our experienced art teachers in Studio 1, campers explore sketching with charcoal, painting like Matisse, sculpting with putty, and more. Wait till you see what they bring home! One of our most popular activities at camp, karate is fun for all ages! We have several Tae Kwon Do black belts on our staff who have been teaching karate with us at camp for years. Children may have the opportunity to take an advancement test for a certificate or belt during the summer. They also have the option to continue practicing with us during the school year. These activities are instant camper hits! From learning chemistry by mixing up gooey globs and making volcanoes erupt, to building Lego bridges and skyscrapers while letting the creative juices flow, we learn about science while having fun at camp! On the Battery Park City ballfields, sports are an integral part of the camp experience. Soccer, kickball, t-ball, whiffle ball, relay races, running games, capture the flag, and parachute games are all a part of the program. Drinking water is always available at the field. On high heat index days, we use the camp yards, gyms or other indoor spaces instead. Andrew and Sal our, Athletic Directors, have over 30 years of experience as physical education teachers and supervise our athletic instructors. Our Athletics Program offers a wide array of organized, ageappropriate games and sports—a daily curriculum of fun! We balance individual skill and confidence-building activities with team games and sports. We help novice players feel good about themselves and offer opportunities to challenge the abilities of the more accomplished athletes. Fun and safety are our highest priorities! Teachers and campers in Studio 2 explore fun craft-making projects with wood, tile, beads, clay, heavy paper, felt, pom-poms and more! These multi-dimensional pieces will be sure to brighten up your summer. Each week our campers enjoy a variety of gym sports and games taught by real P.E. Teachers: basketball, whiffle ball, soccer, relay races, parachute games, batting practice, steal the bacon, four corners and more! The gym is a perfect recreation area rain or shine! Always a favorite for both campers and parents, our famous Junior Division song shows light up the auditorium each season. Families and friends are invited to watch each group of campers in a fun and exciting sing-a-long. You won’t want to miss it! We offer group tennis instruction to our campers. We focus on helping campers learn to hit the ball in a fun and safe environment. This introduces them to a great sport that they can enjoy for a lifetime. Our music program encourages children to get in the groove. It also introduces campers to the rhythms of West African drums. From improvising beats to accompanying stories, to jamming and having a great time, campers love our music program. Movement and dance build coordination and flexibility, while encouraging creative expression. Our movement specialist brings years of teaching experience to the highenergy sessions that are fun for both girls and boys! We like to keep movin’ to the music at the Junior Division! Being on Tribeca’s Pier 25 transports you “Out of the City.” A camp favorite for years even before it was renovated. Miniature golf, beach volleyball, playgrounds, games and more! Our campers always enjoy their trips to the air-conditioned bowling alley where they can knock down some pins with their friends. Our Senior Division day camp is designed to meet the needs and desires of older campers. Our age-appropriate activities are geared towards keeping 4th - 8th graders energized and engaged. Our program is designed to offer a variety of activities, giving consideration to campers' preferences. A daily choice period is integral to supporting the more specific interests of our older campers. Within our Senior Division, creating opportunities for successful participation while building positive social relationships with other campers is a top priority. Our Senior Division campers have a daily choice period. 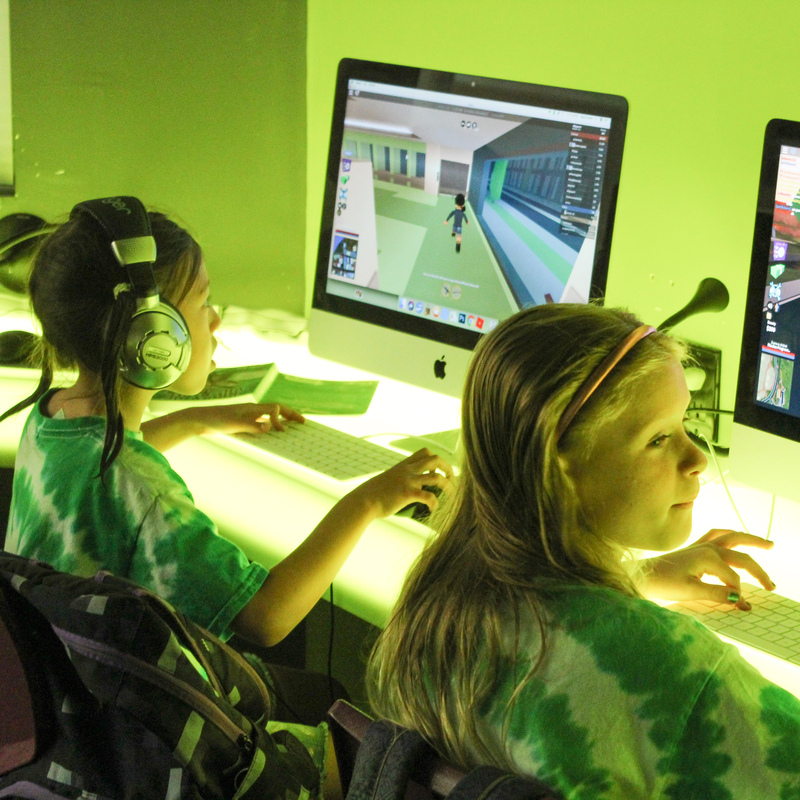 Campers may choose activities such as basketball, soccer, visual arts, dance, digital media, music, and more! On the Battery Park City Ball Fields we play soccer, kickball, field hockey, relay races, capture the flag and beach volleyball. All sports activities are led by one of our 4 phys. ed teachers, ensuring that our campers are working on technique and skill development as well as having fun! This program is designed to help campers build artistic skills while inspiring creativity. Individual and group projects are displayed at our end of summer show. Our oldest campers enjoy a different trip each week. Past favorite trips have included minor league baseball games, Liberty Science Center, Bounce U, and bowling. We're also excited to return to the mini-golf, beach volleyball courts, and bar-b-que lunches at Pier 25! Pier 25 Being on Tribeca’s Pier 25 transports you “Out of the City.” A camp favorite for years even before it was renovated. Miniature golf, beach volleyball, playgrounds, games and more! Bowling Fun Our campers always enjoy their trips to the air-conditioned bowling alley where they can knock down some pins with their friends. Our oldest campers enjoy a different trip each week. Past favorite trips have included minor league baseball games, Liberty Science Center, Bounce U, and bowling. Campers love Pier 25’s mini-golf, beach volleyball, and outdoor sports field, right on the Hudson River. Jr. & Sr. Divisions:Did you say dunk tank? It just doesn't get any better than campers throwing a ball to dunk their favorite counselors. Games, rides and prizes make carnival day a favorite! Creations range from kitchen sink and baseball card hats to gumdrop and floppy court jester hats with moons and stars! Our first session talent show rivals the best acts on Broadway. Campers' families are invited to see the stars shine!